Who should not take Rituxan Vial? 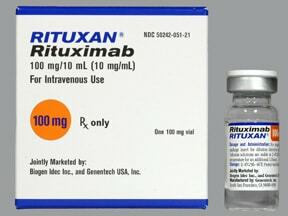 Rituximab is used to treat rheumatoid arthritis and can decrease joint pain and swelling. It is also used to treat certain types of blood vessel disease (such as Wegener's granulomatosis, microscopic polyangiitis) and can decrease the swelling of the blood vessels. What conditions does Rituxan Vial treat? Tell your doctor right away if you have any serious side effects, including: swelling hands/ankles/feet, increased thirst/urination, numbness/tingling of arms/legs. Rituximab sometimes causes side effects due to the rapid destruction of cancer cells (tumor lysis syndrome). To lower your risk, your doctor may add a medication and tell you to drink plenty of fluids. Tell your doctor right away if you have symptoms such as: low back/side pain (flank pain), signs of kidney problems (such as painful urination, pink/bloody urine, change in the amount of urine), muscle spasms/weakness. List Rituxan Vial side effects by likelihood and severity. Before using this medication, tell your doctor or pharmacist your medical history, especially of: lung disease, heart problems (such as irregular heartbeat, previous heart attack), bleeding/blood disorders, current/recent infections. It is unknown if this drug passes into breast milk. Because of the possible risk to the infant, breast-feeding while using this drug is not recommended. You should not breast-feed until treatment is finished and a blood test shows that there is no more rituximab in your body. Ask your doctor when it is safe to breast-feed. What should I know regarding pregnancy, nursing and administering Rituxan Vial to children or the elderly? Some products that may interact with this drug are: other drugs that weaken the immune system/increase the risk of infection (such as tofacitinib, natalizumab, fingolimod). Does Rituxan Vial interact with other medications? Are you taking Rituxan Vial? 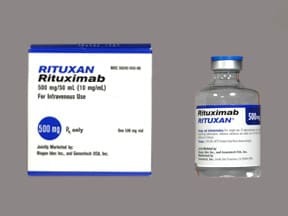 Are you considering switching to Rituxan Vial? How long have you been taking Rituxan Vial?